Clinton and Sanders on Health Care: Do the Numbers Add up for Single-Payer? Dr. Woolhandler co-founded Physicians for a National Health Program, which does research and advocacy for single-payer health care, but does not endorse candidates. She is a professor at City University of New York at Hunter College, who sees patients in the South Bronx and recently co-wrote the piece “On Kenneth Thorpe’s Analysis of Senator Sanders’ Single-Payer Reform Plan.” Almberg is communications director for PNHP. Dr. Woolhandler said today: “The numbers on single-payer do, in fact, add up. 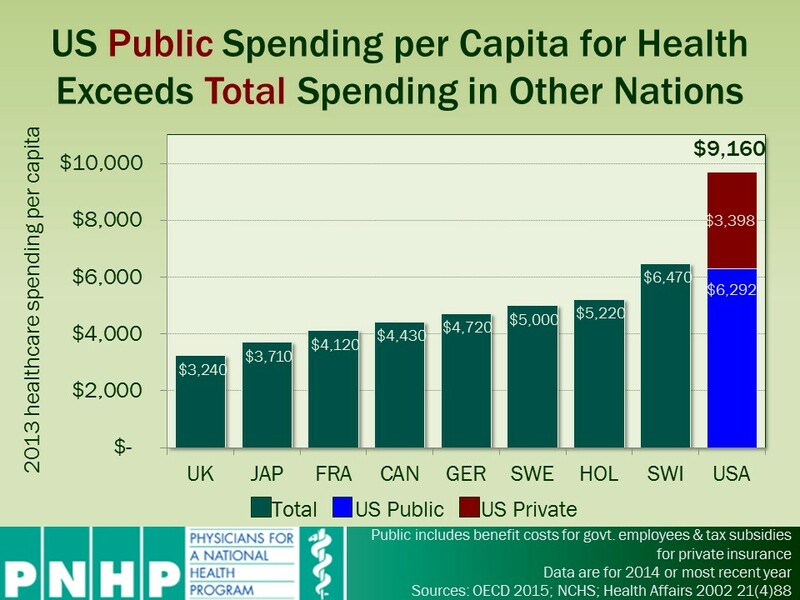 It’s indisputable that single-payer systems in other countries cover everyone for virtually everything, and at much lower cost than our health care system. “For instance, Canadians have a system that covers everyone, without co-payments or deductibles, and they live two years longer than Americans. Yet their system costs about half as much per person as ours. “Much of the cost difference between our system and Canada’s is the extraordinary cost of paperwork in our system. As my colleagues and I found in a study published in the New England Journal of Medicine, our insurance companies’ overhead is seven times higher than Canada’s single-payer program. And insurers force doctors and hospitals to spend billions fighting to get paid. Overall, bureaucracy consumes 31 cents of every health care dollar in the U.S. vs. 16.7 cents in Canada. “Our research shows that if the U.S. moved to a single-payer system as efficient as Canada’s, we’d save $430 billion on useless paperwork and insurance companies’ outrageous profits, more than enough to cover the 31 million Americans who remain uninsured, and to eliminate co-payments and deductibles for everyone. “A single-payer system could save even more money by bargaining with drug companies for discounts on drugs. Other countries get discounts of about 50%, and as the biggest customer we could have the bargaining power to get similar savings. “Finally, single-payer systems have been better at controlling costs over the long-haul. Our medical arms race — with hospitals competing to offer expensive high tech care, even when they don’t do enough to be good at it — has driven up costs and compromised the quality of care. In contrast, single-payer nations have used thoughtful health planning, to invest in expensive high tech care where it’s needed, not just where it’s redundant but profitable.